1. Is your credit card payment facility secured? Our online payment partner MOLPay and Paypal, helps us in processing the payments. They are one of the best and most reputed online payment gateways in worldwide. 2. I don’t have credit card, can I pay using bank transfer? Yes, we accept transfers from major banks (Maybank, CIMB, etc) and Credit Cards (Visa/Master) via MOLPay. 3. I bought the items and is there any hidden charges for the delivery fees? We provide Free delivery to Peninsular Malaysia. The price stated on the deal is the final price; there's no other extra charges. 4. Why have I not received my items? The delivery period is stated within the deal. Once the period of deal is off, we will start on the delivery process. 5. I missed last week’s deal, can I purchase it today? Each deal lasts for limited time and once it is over you can no longer purchase it. Don’t worry though, we feature great deals every day; please stay with us to enjoy more great deals. You can also sign up for our newsletter or become our Facebook fan to keep yourself updated so that you won't miss any of our great deals. 6. Help! I still don’t understand how to purchase a deal. 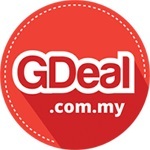 You can write to us at support@gdeal.com.my, our customer support would be more than happy to serve you.